Retired Navy Lt. Cmdr. Anthony Putney recalls often waiting for months before his severely disabled daughter Lily could be enrolled in Medicaid after they made the military move from state to state. That meant no health coverage for a private duty nurse or for expensive necessities such as adult diapers and equipment, things that weren’t covered by Tricare. “During those time periods it was very stressful, which impacted my military readiness,” he said. He remembers those stressful times, such as when his wife would call him at work, in tears, and he could hear Lily in the background. In the midst of discussions about cutbacks to Medicaid, advocates have issued a new report highlighting the importance of this program to about 3.6 million military-connected children nationwide. The vast majority of those — about 3.4 million — are children of veterans. About 200,000 are children of active-duty or retired service members, according to the report. Cutbacks to Medicaid result in less access to these needed programs and services. And, compared to Medicare, the national health care program for those 65 and older, Medicaid reimbursement rates are lower, according to the report. 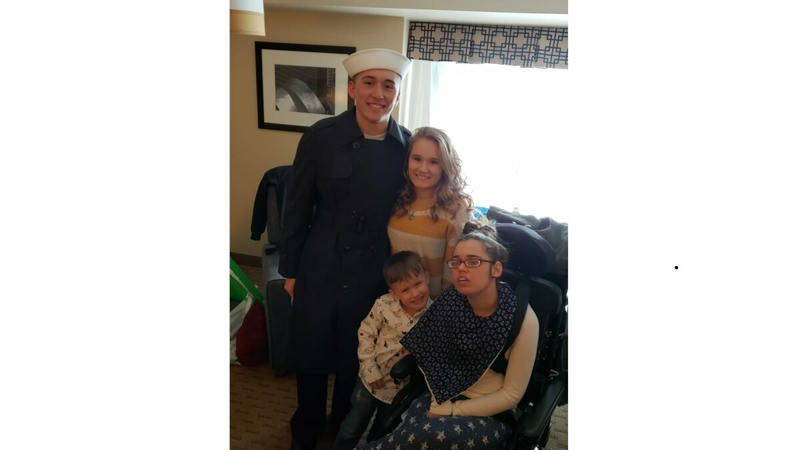 Improvements are also needed in access to Medicaid, a long-standing problem for military families like the Putneys who move frequently, according to the report, "America’s Military Readiness and the Essential Role of Medicaid,” published by the Tricare for Kids Coalition. Medicaid plans are administered by each state, so families encounter “vastly different” programs each time they move across state lines. It’s especially difficult for families with children with complex or chronic medical conditions who rely on Medicaid home- and community-based services. Medicaid is a program funded by the federal government and the states, which provides health coverage to disabled and lower-income Americans, including about 37 million children across the country. Nearly half of the country’s children are on Medicaid. “Medicaid is an essential program for the children of today’s military-connected families, and an essential program for children who serve in tomorrow’s military,” according to report. The coalition includes a number of children’s health care advocacy and professional organizations, disability advocacy groups, military and veteran service organizations and military families. Among those 200,000 children of active or retired service members who are using Medicaid and also enrolled in Tricare, it’s not known how many are active-duty families and how many are families of retirees, said Mark Wietecha, president and CEO of Children’s Hospital Association. He said there are some misperceptions about Medicaid. That includes commercial insurance plans as well as Tricare, he said. Beyond the tens of millions of children across the country who are in Medicaid directly, “there are many thousands of commercially insured kids in Medicaid wraparound programs,” for children with these chronic conditions, Wietecha said. “Tricare is great for well kids, and I can say that for my other children. But if you have any kind of chronic problem, such as cancer, diabetes, endocrine, any kind of genetic problem, any kind of brain or developmental disabilities, Tricare is not good,” said Putney, whose daughter Lily is on Medicaid. Lily, now 20, was a developmentally typical 15-month-old before an ear infection spiraled out of control when the family was stationed in Japan. She was hospitalized for five months at various locations in the U.S. and suffered more than 50,000 seizures. Medicaid became critical in filling the gaps of what Tricare didn’t cover, said Putney, who, inspired by Lily, later became a nurse. There’s a perception that military children are taken care of by the government, said Joyce Raezer, executive director of the National Military Family Association. “Medicaid is the ultimate safety net for our military families and our veteran families for their kids," she said. While the Veterans Affairs department provides health coverage to some veterans, it doesn’t provide coverage for their spouses and children. When service members separate from the military before retirement, they may not immediately find a job or health care coverage doesn’t immediately kick in. “Having access to Medicaid can make a difference to our veteran families in how well they move to the next chapter of their lives," Raezer said.